Microsoft has unveiled a number of software upgrades that it says can help boost productivity, efficiency and security in businesses of all sizes. 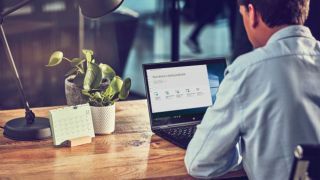 The software giant spoke to TechRadar Pro about some exciting updates and new releases for its Microsoft 365 platform, and how these can have a profound effect on every worker. "In this world of information workers, for far too long, IT has been in the situation of having to choose between giving a great user experience or making it secure,” says Brad Anderson, Microsoft’s corporate vice president of enterprise experiences. “It feels like it has been an either/or...which doesn't translate into a good user experience,” he adds, noting that often it is not Windows which is slowing down devices, but the additional agents added on by IT departments. Now, Microsoft is looking to conquer these issues with a wealth of new software updates and releases for Microsoft 365 and beyond, aimed at greatly improving workplace efficiency and productivity, whilst helping reduce IT costs and workloads. First up is the launch of Windows Virtual Desktop (WVD), what Microsoft says is a highly-optimised experience that offers a simpler, more effective way to run virtual services. "What we're seeing as the world moves towards the cloud is companies wanting to get out of the business of growing and maintaining these big server farms...Microsoft can do this,” Anderson notes. Although still at the preview stage, Anderson says that WVD will offer "the modern desktop in the cloud" - essentially, Windows 10 hosted in Azure, on a desktop in the cloud. Customers can choose whether they want this desktop running locally or in the cloud, or run Windows 10 in a shared public cloud, which can only be done there. Anderson says this can provide major boosts in speed, efficiency and security, as well as providing a simpler and more effective way to run data-hungry apps - noting it can run thousands of virtual desktop sessions a minute. Microsoft is also revealing great strides in its security protection, primarily in Windows Defender, which is getting a new name. The company’s antivirus platform will now be coming to Mac for the first time, but as Microsoft Defender. This ticks off a common customer demand, Anderson says, noting that with the program already protecting more Windows PCs than any other commercial anti-malware (including running on over 50 percent of Windows 10 devices in commercial organisations) the need for greater cross-platform integration was key. “There’s an art and a science to building an agent that runs on Mac that is non-impactful, and is able to understand how the Mac operating system works,” he says. Anderson notes that Microsoft’s position as one of the world’s leading software providers means it is sitting on an incredible amount of telemetry data that can be used to develop better security protection, whilst also spotting emerging threats before they go viral. He says that Microsoft’s systems receive 6.5 trillion pieces of feedback every day to analyse, alongside 630 billion authentications per month, and scanning 430 billion emails per month going through Office 365. This has led the company to also today announce Microsoft Threat Vulnerability Management, which looks to identify and target known vulnerabilities that often plague companies for long periods. Once detected and analysed in the Microsoft cloud, the system can flag the threat immediately, allowing the company to quickly roll out protection to other geographies to prevent widespread infection, as well as giving IT teams visibility into the threats that are most likely to affect their business. Overall, Anderson says that the new updates will greatly enrich the Windows and Microsoft 365 user experience for all users, opening up new opportunities across the board. Put bluntly, he notes that Microsoft 365 is designed purely to help businesses and their workers work smarter and more efficiently, whilst staying secure and connected at all times. “The quality of what we're doing with Windows right now...is the highest quality we've seen in years,” he says.